As India finds itself on the verge of an industrial makeover, the country is exhibiting a great demand for power supply. The weakest link in this situation, however, is that the country's energy mix largely depends on fossil fuels. The high cost of these fossil fuels and the irregularities in the supply of energy have left several industrial verticals in a lurch, bringing down their productivity by about 10% every day. According to a research report published by Transparency Market Research, these dynamics of the energy market have created a huge stir amongst manufacturers and industry honchos to seek smooth power supply solutions. Citing these reasons, Transparency Market Research states that the India regenerative uninterruptible power supply market has a huge scope in the foreseeable future. According to the research report, the opportunity in the India regenerative UPS market will be worth US$163.11 mn by 2024 from US$76.86 mn in 2015. Between the 2016 and 2024, the overall market is anticipated to rise at a CAGR of 8.7%. The impressive growth of this market will be attributable to the relentless growth of the Indian economy and the steady prospect of its financial future. The rampant industrialization that needs the constant power supply will steer the growth of this market. The unique selling point of regenerative UPS systems is their ability to conserve energy for a nation that has been battling the energy crisis since long. Given these factors, the regenerative converter is the top selling product in the overall market. Installation of these units not only ensures an uninterrupted supply but also allows a seamless manufacturing experience. The report suggests that regenerative converter UPS units are also being considered by end users such as the oil and gas industry, pharmaceutical industry, and the food and beverage industry as they prevent the machinery from being damaged. Despite the shining future of the India UPS market, the heavy installation costs and the capital-intensive nature of this equipment are shadowing the market. The failure to see the long-term benefits of installing UPS units such as improving operational efficiency are also contributing towards hampering this market from realizing its full potential. Furthermore, the undeterred entry of counterfeit UPS units into the Indian market are also preventing the possible growth options of this market. Regionally, the south zone of India is expected to show a remarkable support for the growth of the India UPS market. Besides being the most developed region in the country, it has huge manufacturing hubs. The south zone has a strong presence of key automobile manufacturers, textile industries, chemical companies, and several food and beverages players as well. Adoption of energy conservation measures by these companies is going propel the India UPS market in the forecast period. The chief operating players in the India UPS market are Genesis Power Equipments Limited, Hitachi Hi-Rel Power Electronics Pvt. Ltd., Riello PCI India Pvt. Ltd., SU-KAM Power Systems Ltd., and Bonfiglioli Transmissions Pvt. Ltd. amongst others. To create a mark amongst the consumers, these companies will have to cater to the specific needs of their clients by customizing their solutions. This research study analyzes the market for regenerative uninterruptible power supply (UPS) in India in terms of revenue (US$ Mn). 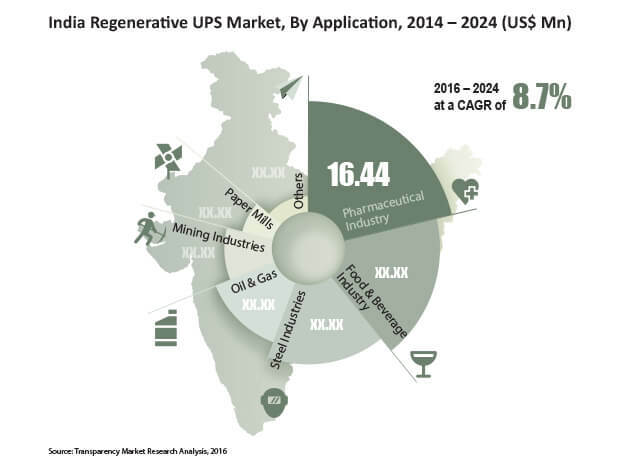 The regenerative UPS market in India has been segmented on the basis of product type, technology type (braking application), application, and geography. The geographical segmentation includes four zones – major players in the India regenerative UPS market. The report features a detailed regional segmentation with market growth forecasts for the 2016−2024 period (major players in the India regenerative UPS market). For the research, 2014 has been taken as the base year, data for 2015 is estimated, while all forecasts have been given for the period from 2016 to 2024. Market data for all the segments has been provided at the zonal level from 2016 to 2024. The report provides a broad competitive analysis of companies engaged in the regenerative UPS business in India. The report also includes the key market dynamics such as drivers, restraints, and opportunities affecting the regenerative UPS market. These market dynamics were analyzed in detail and are illustrated in the report with the help of supporting graphs and tables. The report also provides a comprehensive analysis of the regenerative UPS market in India with the help of Porter’s Five Forces model. The analysis helps in understanding the five major forces that affect the structure and profitability of the market. The forces analyzed are bargaining power of buyers, bargaining power of suppliers, threat of new entrants, threat of substitutes, and degree of competition. The high-level analysis in the report provides detailed insights into the regenerative UPS business in India. There are currently numerous drivers of the market. The most prominent drivers include growing industrial sector, rising demand for power, high industrial power deficit, and integrated services provided by regenerative UPS suppliers. Growth dynamics of India’s manufacturing industry by various zones are also considered for market analysis. Market attractiveness analysis was carried out for the regenerative UPS market in India on the basis of application. Market attractiveness was estimated on the basis of common parameters that directly impact the market in different zones. The regenerative UPS market in India has been segmented into four zones: East Zone, West Zone, North Zone, and South Zone. Regional data has been provided for each sub-segment of the regenerative UPS market in India. Key players in the market include Emerson Network Power (India) Pvt. Ltd., Riello PCI India Pvt. Ltd., Yaskawa Electric India Pvt. Ltd., Hitachi Hi-Rel Power Electronics Pvt. Ltd., Sew-Eurodrive India Pvt. Ltd., Bonfiglioli Transmissions Pvt. Ltd., and ARVI Systems & Controls Pvt. Ltd. The report provides an overview of these companies, followed by their financial details, business strategies, and recent developments.